The annual period of Remembrance and the Poppy Appeal runs from 28th October to 12th November and is being supported by a number of bus companies up and down the United Kingdom. The following illustrates a selection of the companies and how they have decorated representative buses from their respective fleets to mark the occasion. 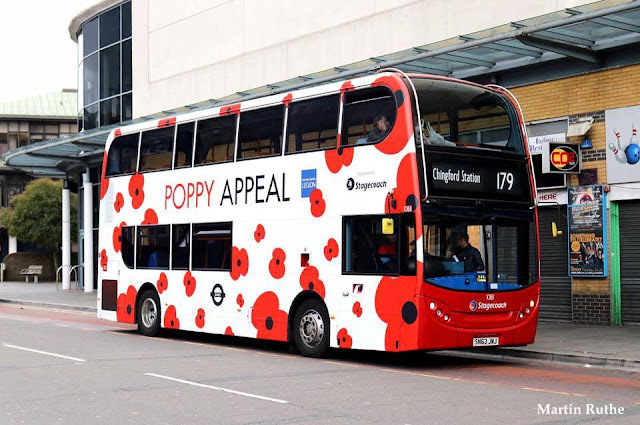 For the past number of years, TfL has asked its major bus operators in London to support their poppy appeal, by allowing some of their buses to be wrapped in the unique designed British Legion poppy appeal wrap. Arriva London has always been proud to support this idea, and for this year have donated two of their double-deck vehicles to the process - one from its North London operation and one from the South. The buses, which were recently on display on the South Bank opposite the Houses of Parliament, will be seen throughout London and the City until November 12th, as a mark of respect for the sacrifices made by London’s service men and women, past and present. They will all be out and about for London Poppy Day, which will also see uniformed personnel from the forces at forty Tube stations collecting donations, whilst military bands entertain commuters at Canary Wharf. Commuters will also be encouraged by announcements from Dame Barbara Windsor and Shane Ritchie, recorded to encourage Londoners to give as much as they can. This year also marks the 94th year of the London Transport Old Comrades Association, who will continue the tradition of marching alongside the Armed Forces and laying a wreath at the Cenotaph in the Annual Remembrance Sunday parade on 12th November. London's bus staff were given the right to march by King George V who granted this honour to the staff of the London General Omnibus Company in 1920, in recognition of the services rendered by the men who drove buses to the front line in France and Belgium from 1914 to 1918. Arriva North East and Yorkshire are supporting the Poppy Appeal again this year with 12 specially-designed ‘Poppy Buses’ hitting the road to mark Remembrance Day. Each depot in the North East and Yorkshire area will have its own ‘Poppy Bus’ and they will be out and about until Monday, November 13th. 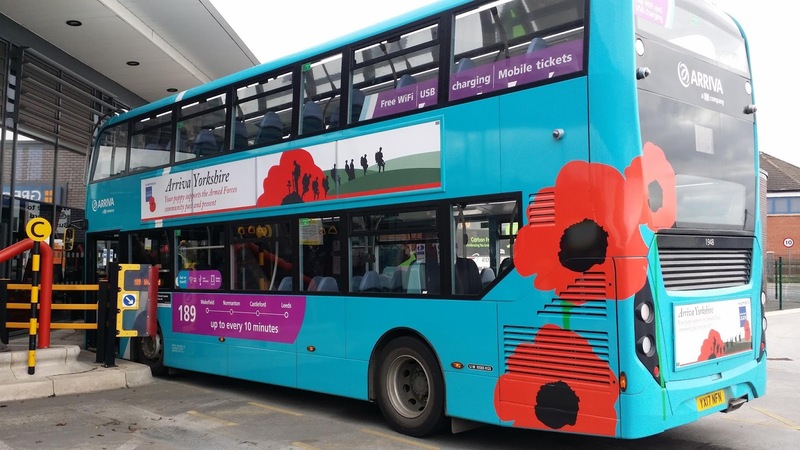 These buses will operate on popular Arriva routes and will act as a mark of respect for the sacrifices made by service men and women both past and present. The special buses feature giant poppies and dedicated artwork supporting The Royal British Legion, on the outside and inside of the bus. These custom vehicles have been created with the support of Logoshack and Exterion Media. The company will also be transporting service men and women to Remembrance events across the region. Recently soldiers from Catterick Garrison were transported to Leeds Poppy Day by Arriva Yorkshire and Arriva North East will perform a similar service for soldiers to an event in Stockton on November 7th. Danielle Neighbour, Community Fundraising Manager for the Royal British Legion said: "We are incredibly grateful to Arriva for their support of this year’s Poppy Appeal and the parades they have agreed to transport soldiers too. The Royal British Legion’s vital work is entirely dependent on the public’s generous support to help anyone currently serving in the British Armed Forces, veterans, and their families. "The Legion uses your donations in so many ways including providing crisis grants, offering the children of Armed Forces personnel adventure breaks, researching the impact of blast injuries on the body, lobbying the government on key issues, and advising on benefits and money problems." Over the course of the two weeks, Arriva’s twelve ‘Poppy Buses’ will cover more than 42,000 miles. BUS drivers will be showing their support for the Royal British Legion as 30 decorated Network Warrington vehicles are set to hit the roads. Staff from the company are also fundraising by selling poppies in the town centre this weekend ahead of Remembrance Sunday. He added that the company has supported the appeal for many years. The Poppy Appeal has received a donation of £300 thanks to Yellow Buses and the Daily Echo. Royal British Legion appeal organiser Wayne Morris visited the bus company to receive the cheque. The Carbon Stoppers initiative is run by Yellow Buses and the Echo and has handed out nearly £20,000 to charities and good causes since its launch in 2008. Yellow Buses is also displaying poppies on its fleet and has collecting tins at its headquarters and in its office in Bournemouth square. Fiona Harwood from Yellow Buses said: “We always support the Poppy Appeal and display poppies on our buses. The Royal British Legion is asking the nation to ‘Rethink Remembrance’ by recognising the sacrifices made by the armed forces, past and present. By wearing a poppy, people aren’t just remembering the fallen, but supporting a new generation of veterans and service personnel that needs support. trentbarton will show its support for the men and women who have served their country with 185 of its buses and coaches proudly wearing a poppy in the run up to Remembrance Day. To mark trentbarton’s donation of £800 to The Royal British Legion’s annual Poppy Appeal, a bus and driver met members of the Legion’s Ilkeston branch at Ilkeston Market Place. trentbarton driver Jon Hickman represented trentbarton – Jon served in the Army from 1988 to 1993 as an infantryman, including tours of duty in Northern Ireland, the Falklands and Cyprus. Jon, who joined trentbarton six years ago, said: “I wear a poppy every day – I have two poppy tattoos. Having a poppy on the bus means a lot to me. Remembrance Day is a sombre day but I also remember the good times I had in the Army. Brian Brown, a local community support officer for the Royal British Legion, said “The Royal British Legion is asking the nation to Rethink Remembrance by recognising the sacrifices made by the Armed Forces community, past and present. Jordan Kemp, marketing and communications manager at trentbarton, said: “The Poppy Appeal plays a key role helping people and organisations to remember the sacrifices made by members of the British armed forces, past and present. “The Appeal also raises substantial sums of money which The Royal British Legion puts to excellent use for members of the Armed Forces community. We unveiled our annual Lothian 'Poppy Bus' at the opening of this years Remembrance Garden in Princes Street Gardens. This year’s high impact design takes a modern turn featuring a creative of cascading bright red poppies set against an all-white background. The bus will run on various routes throughout Edinburgh and the Lothians during November. To mark the occasion, Lothian invited former service personnel who now work for the company to attend the launch. We are delighted to once again have such extensive and visible support from Lothian Buses. The bus wrap is stunning and it is extremely heartening to see every single bus in and around Edinburgh displaying poppies. As the fleet travels many miles over the coming fortnight, we hope it will encourage and inspire the public to go the #ExtraMile in their support of this year’s Scottish Poppy Appeal. As well as the specially created ‘Poppy Bus’, each vehicle in the Lothian fleet, including East Coast Buses, Lothian Country and Edinburgh Bus Tours, will be decorated with an individual poppy vinyl to show our partnership with Poppyscotland and support of the campaign. We will also fundraise internally with poppies and pins and staff will be able to place wooden crosses in the Lothian area of the Remembrance Garden. Edinburgh and the Lothians have a long-standing special relationship with our armed forces and Lothian has many former military personnel working across our business in a range of different roles. Poppyscotland's annual fundraising appeal is very close to our hearts and is important to our staff and to our customers, which is why we make a particular effort every year to recognise and honour the armed forces. We hope that our Poppy Bus will once again be popular with the residents and visitors of the City and prove to be a fitting tribute for those who have given service to our country. The theme of this year’s Scottish Poppy Appeal is #ExtraMile. While tin donations remain absolutely vital to help fund Poppyscotland’s life-changing support, the charity is encouraging supporters – existing or new – to go the #ExtraMile in their fundraising for this year’s Appeal. To do this they have been sharing the stories of some of their amazing fundraisers and Poppyscotland hope this will inspire others to do the same, whether that be a bungee jump or a bake sale. Every extra penny raised makes a huge difference. For more information visit www.poppyscotland.org.uk/extramile. A further posting will appear on Remembrance Day itself, the 11th November.